Do you encounter any difficulties configuring your Yoast SEO plugin? Want to know more about all features and settings of the Yoast SEO plugin? We have great news for you! Joost has made a series of Yoast SEO plugin tutorials for every tab on every page of the Yoast SEO configuration pages. A playlist of a total of 33 screencasts is available for free for all of our users! In these video tutorials, Joost de Valk will explain all the settings of the Yoast SEO plugin in detail. He’ll talk you through all the possibilities the plugin has and explain why you should configure your plugin in a certain way. With every update of Yoast SEO, new screencasts will be released. Check out our extensive playlist! And, don’t forget to subscribe to our YouTube channel so you won’t miss any updates! 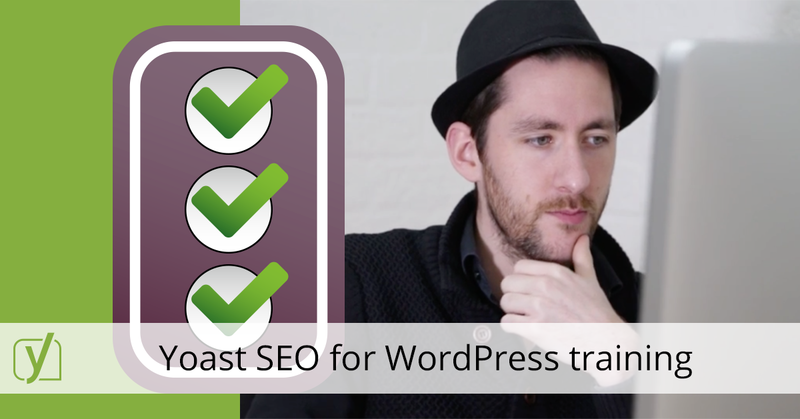 For those of you who want to dive in all the possibilities our plugin has, we have developed a Yoast SEO plugin training. This training will be released on Wednesday the 30th of March. This training consists of these same 33 Yoast SEO plugin tutorials and of 8 in-depth instruction videos in which Joost de Valk gives extra information about all the settings. On top of that, the course comes with a lot of challenging questions, to test whether or not you truly understand the Yoast SEO plugin. Once you have completed the Yoast SEO plugin training, you’ll receive a badge and a certificate to put on your site. The badge and certificate are a Yoast seal of approval. If you have completed our course, you’re qualified and able to set up and properly configure our plugin. Want to become a Yoast SEO plugin expert? The plugin training will be available next week! The Yoast SEO for WordPress training will cost $129 for the first year and $69 in the following years. The first week you can even get it for $99! The videos and the questions will be updated after every major release of Yoast SEO, making sure you’ll remain a real Yoast SEO plugin Expert!